I don't know a single person who was not surprised by seeing Bilal Asif's name in the Pakistan squad for the test series against Australia. Everyone wondered why he was the only off spinner in the squad and asked where were all the other off spinners. I was quite sure that Bilal Asif will not play a single game and that thought became even more certain when Pakistan called up Mohammad Hafeez to join the squad. But then, Shadab did not recover from his injury and on the eve of the first test against Australia, Sarfraz announced that Bilal Asif will play. I read someone's social media post that said that this was Pakistan's weakest bowling attack ever. Even I was skeptical about the support for Abbas and Yasir, so I did not even bother to refute that statement. And then on day 3 of the first test, Bilal Asif surprised not only Australia but all of Pakistan too! Bilal Asif's magic made the Aussies fold like a pack of cards as they lost 10 wickets, 6 of them to Asif, for 60 runs in 30 odd overs resulting in one of the worst ever collapses in Australia's test history. Asif's 6-36 is the third best bowling figures in an innings by a Pakistani debutant and the second best by a Pakistani debutant off spinner. Look at that average, economy, and strike rate. Never has a Pakistani debutant dominated the way Bilal Asif did. Pakistanis love to create the unexpected, don't they? I don't know any other team that dismisses the fans' expectations, both good and bad, like Pakistan does! 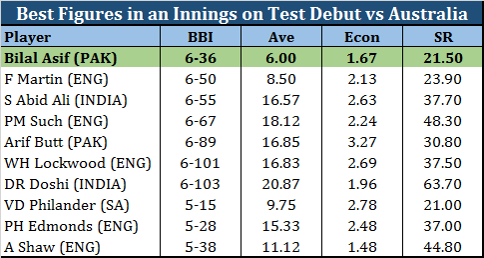 Asif's figures are not only one of the best ever for a Pakistani debutant, but they are one of the best among all off spinners on debut. 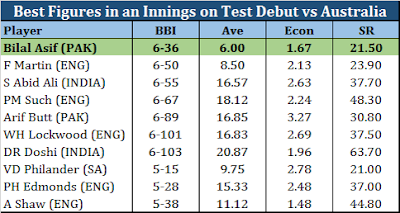 Fourth best to be exact, but again no debutant has done it as economically or as destructively as Asif did against Australia. And that holds true among all bowlers that have made their test debut against Australia. No one has produced as a good a spell as Asif's 6-36 on debut against Australia. It is not surprising that no one considered Asif to be test material before the series started. He doesn't have a first class record that showcases abundant talent, nor does he have domestic performance that have startled, yet the Pakistan selectors and the team management saw something in him. That something paid off yesterday. Fortunately, Shadab Khan was not fit for this test, because if he was then I doubt Asif would have ever gotten a chance. And the way Pakistan's other leg spinner went in the first innings, wicketless, Pakistan may not have been in the position they are in now had Asif not been in the XI. So thank you Inzamam, thank you Sarfraz and Mickey, and thank you Shadab for letting us witness the heroics of Bilal Asif. "Being a professional cricketer, you need to be strong from within. When I was not getting my big break, I kept on working hard. I believe, one can obnly work hard, success is in the hands of Allah. I kept on working hard, 2015 is when I last played for Pakistan (ODIs v Zimbabwe). In the last three years I attended camps at the National cricket academy. I want to mention Mushtaq Ahmed here. I want to thank him for teaching me a lot. Today, I reaped rewards for all the hard work he put in. The credit of today's performance goes to Mushi Bhai (Mushtaq). He has been my biggest support"
"No I wasn't bothered about that (my action was called in the ODIS in Zimbabwe in 2015). That's a thing of the past. I concentrated on my bowling performance today. Thank God I did well." "I wasn't sure I was going to play the game beforehand. I only realized when the final XI was announced. Well they had announced the 12, a day before the Test, so I had an idea but wasn't sure. Whenever I am in the squad I keep my confidence level high. I was always ready to grab my opportunity with both hands." "I have been bowling for a while, in first class and ODIs (List A). I had an idea of how to bowl on this pitch. The conditions here are conducive for spin. I tried to vary my pace. Thankfully, I achieved the desired results." "This is a team game. Yasir Shah and Hafeez are world-class bowlers, drawing comparisons is unfair. To say that they aren't good because they were wicket-less today doesn't make sense. It was my day today. I was lucky. I took time to get my rhythm going. I didn't find success in the first session. There was a bit of pressure but I refocused in the afternoon and thankfully was successful."